The famous Haute Route is Europe's "must do" ski tour. This trip includes five days of ski touring, three days of lift accessed skiing, amazing views, and beautiful huts. The tiny packs and big vistas make this tour one you will never forget. Join Mark Smiley, Janelle Smiley, this spring. Mark is an internationally certified IFMGA mountain guide. Janelle is an accomplished ski mountaineering athlete and photographer. Together we will create an amazing, memorable experience for you. The goal is to have good, safe fun. Your vacation days are precious, so this trip is designed to maximize experience. That requires you to train hard prior to the trip so we can avoid the undesired slow-moving elephant train drudgery. Our itinerary plans for an above average distance per day, leaving more time to ski down, rather than across. We know that fit skiers will have no problem with the daily mileage, and are apt be bored with a shorter mileage itinerary offered by others. Additionally, we include three lift tickets to the best resorts in the Alps before during and after the tour. This trip is the best way to sample what European skiing has to offer, and only wanting more the following year. The total trip time is door to door is nine days, which includes two travel days and seven guided skiing days. A significant perk of skiing with us is the photos. We will shoot professional images with high-end equipment. Excellent photography enhances the experience, captures memories, and inspires family and friends back at home. We guarantee that our images will bring a smile to your face for years to come. Just say no to capturing your vacation with iPhone selfies and typical summit shots. Our shots will be of you shredding pow in an amazing place. Photos from the 2016 trip. ° Unprecedented low ratio for greater flexibility and service. ° Trip is catered to fit, exciting skiers looking to push their bodies. 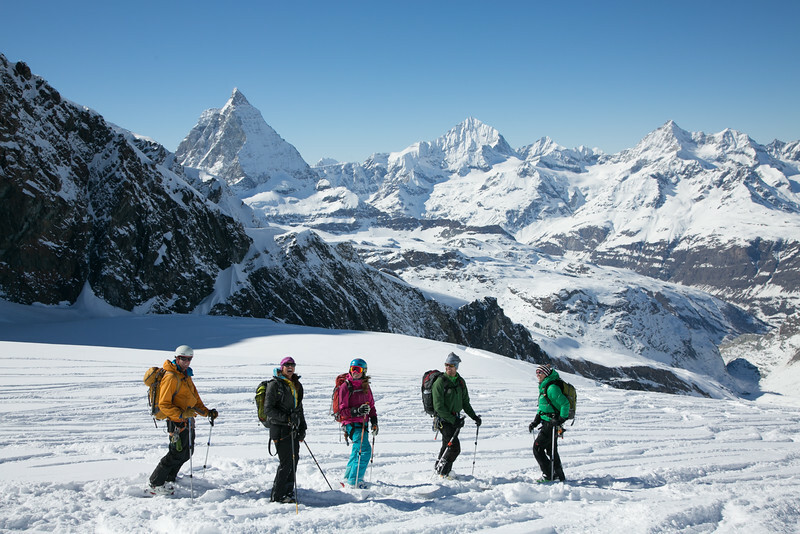 ° IFMGA Mountain Guide to lead the trip. ° Janelle's female presence brings balance to the leadership team. ° Photos will be taken of you in action skiing in this great location. ° Ski the most classic line in Europe, with resort stops along the way. ° Work directly with us from initial inquiry to the final shared photo. April 6: Ski in the Chamonix area, insure all luggage arrives. Includes: Lodging nights of April 5 -12 (double occupancy), breakfast and dinner at each hut day (while on the tour, not in town), all guiding fees, all mechanized transport during the itinerary (shuttles, Verbier resort lift tickets, taxi), photographs taken by Mark & Janelle, mentor advice (we will teach along the way), crevasse rescue & snow anchor building training, detailed gear suggestions, making your pack under 15 lbs. (6.8Kg), & baggage transfer Cham-Zermatt. After the trip, Mark will edit the top photos for your personal use. Then you will receive a 20"x24" ready to hang float wrap print of your favorite image. Does Not Include: Airfare, airport shuttle to Chamonix ($25), any beverages ($20/day), lunches ($10), train from Zermatt to airport ($60), personal trip insurance (approx $75-$150), expenses incurred from itinerary deviations (for weather or any other reason), and the 12-15 meals while in Chamonix, Zermatt and Verbier, and any other misc expenses.